In this major new book, Wolfgang Behringer surveys the phenomenon of witchcraft past and present. 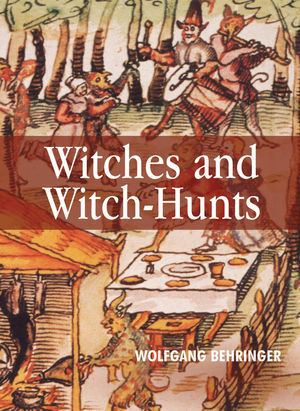 Drawing on the latest historical and anthropological findings, Behringer sheds new light on the history of European witchcraft, while demonstrating that witch-hunts are not simply part of the European past. Although witch-hunts have long since been outlawed in Europe, other societies have struggled with the idea that witchcraft does not exist. As Behringer shows, witch-hunts continue to pose a major problem in Africa and among tribal people in America, Asia and Australia. The belief that certain people are able to cause harm by supernatural powers endures throughout the world today. Wolfgang Behringer explores the idea of witchcraft as an anthropological phenomenon with a historical dimension, aiming to outline and to understand the meaning of large-scale witchcraft persecutions in early modern Europe and in present-day Africa. He deals systematically with the belief in witchcraft and the persecution of witches, as well as with the process of outlawing witch-hunts. He examines the impact of anti-witch-hunt legislation in Europe, and discusses the problems caused in societies where European law was imposed in colonial times. In conclusion, the relationship between witches old and new is assessed. This book will make essential reading for all those interested in the history and anthropology of witchcraft and magic. Wolfgang Behringer served as chair in early modern history at the University of York (UK) from 1999 to 2003, and is now professor at the Saarland University (Germany). 2. The Belief in Witchcraft..
3. The Persecution of Witches..
4. The European Age of Witch-Hunting..
5. Outlawing Witchcraft Persecution in Europe..
6. Witch-Hunting in the 19th and 20th Centuries..
7. Old and "New Witches"..
"An eye-opening accomplishment ... [Behringer's] careful and nuanced volume attests to the erstwhile human tendency, still tragically prominent, to succumb to paranoid fantasies about one's neighbours, colleagues and constituents: to accuse them of being in league with dark forces; to work to isolate, hound and even expunge them from the body politic." "Wolfgang Behringer establishes the importance of a truly global history of witchcraft. Setting aside familiar Western notions, he deploys a more comprehensive definition of witchcraft as the malicious use of evil magic. He brilliantly sketches the history of European witch-hunting and uses this to illuminate the twentieth-century struggle against witches in many parts of the post-colonial world such as South America, India, Indonesia, Malaysia and Papua New Guinea. This book marks a real advance in our understanding of witchcraft, and a remarkable and astute blending of anthropology with history." "Witchcraft has recently been the subject of an enormous amount of research and yet some of its main issues still need reappraisal. This book makes a compelling case for re-examining witchcraft in a fundamental way by reconnecting the new historical scholarship with the discipline of anthropology and treating the subject in a world perspective and as a universal phenomenon. Already Europe's leading expert on the early modern witchcraft trials, Wolfgang Behringer not only gives us a superb overview of where our knowledge of them currently stands but takes us on a global tour of witchcraft in modern societies. Unexpectedly, we discover how much the European and non-European experience have had in common."